Sinai Hospital of Baltimore implemented the Patient-Centered Care (PCC) delivery model (also known as the “Patient-Focused Care” model) during the hospital reengineering era of the early 1990s. The Patient-Centered Care model was, and continues to be a dominant model in contemporary nursing practice. Sinai’s aims for patient-centered care are to 1) promote appropriate grouping of patients, 2) improve responsiveness through restructured services, 3) decentralize clinical services, 4) empower nurses, and 5) improve continuity of care in order to meet predetermined outcomes. 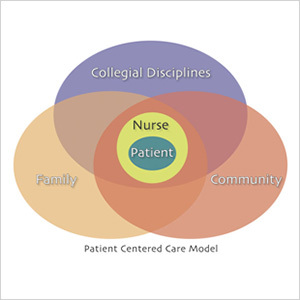 The Patient-Centered Care conceptual model serves as a schematic expression that demonstrates the interdependent relationships that exist between nurse, family, community, and professional colleagues, all working in concert to serve the patient at the center. Theoretically, the PCC Model links the role of the nurse with the organization’s vision and mission while serving as a framework for how our nurses do their work as well as how they communicate and collaborate. On a more practical level, the model promotes the professional role of the Registered Nurse as coordinator of care, working with family and colleagues from across disciplines (including medicine) to ensure continuity and to help meet the goals of nursing which include promoting independence, maintaining and restoring health, or supporting a peaceful death. Essentially, the Patient-Centered Care model conveys the values and beliefs that shape the practice of professional nursing at Sinai Hospital of Baltimore. View the Patient Centered Care Model PDF. 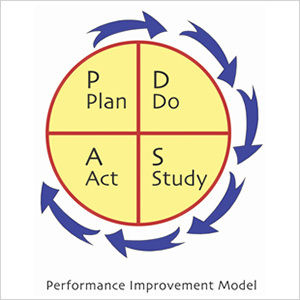 Nurses at Sinai Hospital of Baltimore employ the PDSA model (Deming Cycle) in projects aimed at improving performance and quality throughout the organization. The PDSA model, also known as the Deming cycle is a continuous quality improvement model that reflects a logical sequence of four repetitive steps aimed at quality improvement and learning. By using the PDSA model, nurses at Sinai Hospital conduct analysis, develop action plans, implement change, and study results in their quest to provide the highest quality of nursing care. View the Performance Improvement Model PDF. Nurses at Sinai Hospital of Baltimore influence practice from the bedside to the boardroom. One mechanism used to influence practice is through the Shared Decision-Making Council Structure. The Council Structure is a 4-tier model composed of nurse-led councils and committees charged with shaping nursing practice in the organization. 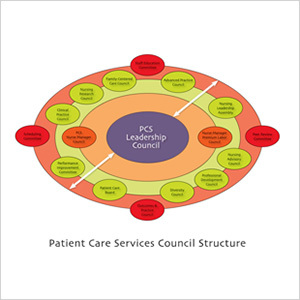 View the Patient Care Services Council Structure PDF. Nursing research is an integral part of nursing practice at Sinai Hospital of Baltimore. 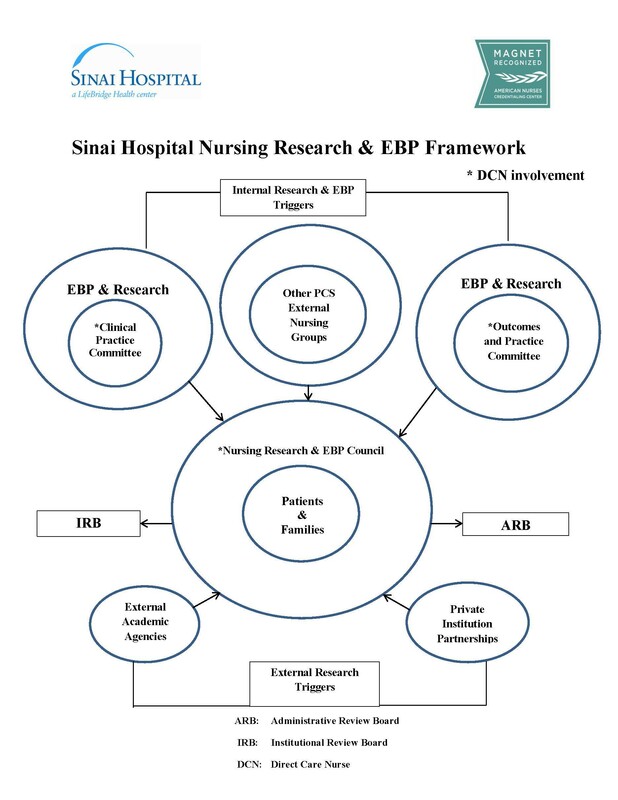 In 2005, recognizing the need for a model to help guide clinical inquiry, the Nursing Research Council developed a conceptual model for nursing research at Sinai based on a three-prong approach to nursing research. Production of original nursing research to help support the practice of nursing in the organization. The Sinai Hospital Conceptual Model for Nursing Research reflects all aspects of the three-prong approach, illustrating that the major role of nursing research in the organization is to help create a better healthcare experience for both patients and families. 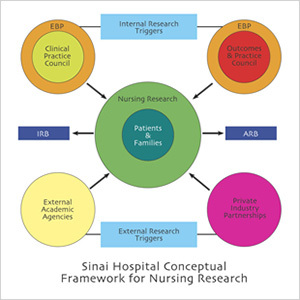 View the Sinai Hospital Conceptual Framework for Nursing Research PDF. To see a complete list of council structures, please click here. Nurses at Sinai Hospital of Baltimore recognize the importance of understanding and integrating the foundation for research and evidence-based practice in the organization. The Conceptual Basis for Nursing at Sinai is a compilation of models and conceptual frameworks that shape nursing practice at Sinai Hospital of Baltimore. Click the images above to learn more. Nurses at Sinai Hospital of Baltimore recognize that critical synthesis and thinking skills as well as evidence-based practice are essential for making clinical decisions and maximizing quality and effectiveness of care. Additionally, we understand that nurses can no longer rely solely on clinical experience and that nurses should be encouraged to question their practice and look for alternative methods that will enhance the deliver of nursing care. By using a focus-group format in early 2005, nurses at Sinai Hospital of Baltimore chose the Rosswurm and Larrabee Model for Evidence-Based Practice to serve as a framework for EBP in the organization. The Rosswurm and Larrabee model was selected from a group of 5 models and conceptual frameworks reviewed by the group. The Rosswurm and Larrabee Model facilitates a shift from traditional nursing practice based on intuition to one steeped in scientific evidence. Ultimately, the model helps Sinai nurses integrate evidence-based changed into practice. Click the image to enlarge view.